Green Umbrella, Green Produce, Guest Post by Katie Martin! When I first got to Washington Heights, it was challenging navigating where to buy food. You’ve got your bodegas, convenience stores, fast food chains, and hole-in-the-wall restaurants. Plenty of places to grab a quick bite or some basic foods, right? But when purchasing apples at Gristedes means spending $10 every week, I was open to seeing what other options for produce are around. I quickly noticed a smattering of carts in the neighborhood, adorned with green umbrellas and overflowing with fresh vegetables and fruits. Have you spotted them too? There’s usually one parked and ready on Broadway and 169th. Loving the fact that they seemed to have great deals on fresh produce, I wanted to learn more about what they were about and where they came from. My first theory was that people trucked in produce to sell for cheap on the street and avoid all the red-tape of dealing with the authorities. This actual isn’t the case. After talking with a few vendors near CUMC and sleuthing online, I was able to connect the dots. The carts with the green umbrellas are legit. Greet Carts were legally enacted with Local Law 9, signed by Mayor Bloomberg on March 13, 2008. Every vendor has a mobile food vending license ($50) and a Green Cart permit ($75). These Green Carts can only sell raw fruits and veggies. No frozen and processed produce allowed. Their mission is to improve access to fresh produce in underserved areas of NYC. The number breakdown for Green Carts in the boroughs of NYC is 350 for Brooklyn, 350 for the Bronx, 150 for Manhattan, 100 for Queens, and 50 for Staten Island. Even though the program is relatively new, hints to positive lifestyle changes within the communities with these carts have been seen. Since the law was enacted in 2008, a 2010 survey showed a significant increase in the percentage of adults in the targeted boroughs that reported eating 5 or more servings of fruit and vegetables in the previous day. From 2004 to 2010, surveys of individuals in NYC exhibited a significant decrease in the percentage of individuals eating no vegetables or fruits. In addition, in September 2011, the Green Cart program received almost double the amount of applications for Green Carts than they could accept. Granted change can be slow, but these statistics are indicators that changing accessibility and visibility of fresh produce can do wonders. If you’re interested in learning more or seeing if there’s a Green Cart on a street near you, definitely check out the NYC Department of Health website. 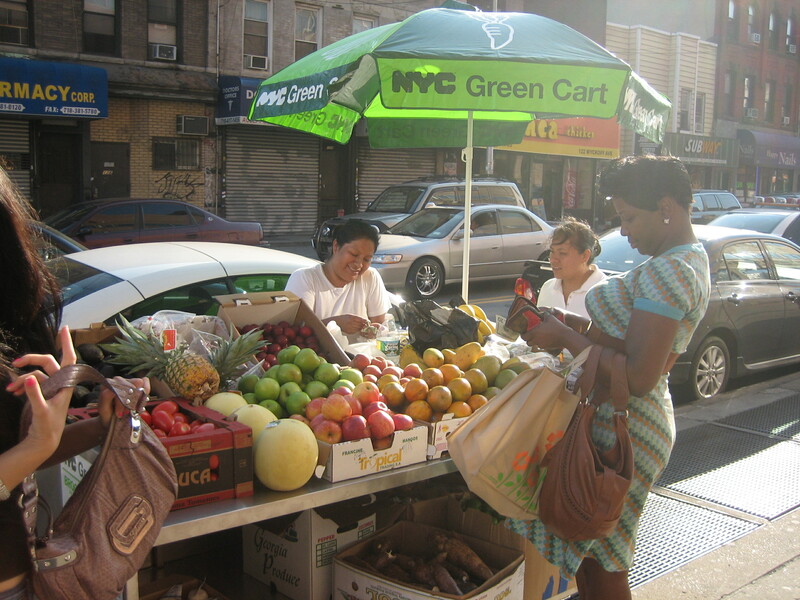 Next time you spot a cart with a green umbrella and some bananas, feel free to pick up one or two and support the movement of making fruit and vegetables readily accessible to the NYC population. I felt like I won the lottery when I bought a quart of strawberries for $1 a week ago. That could be you. Stay tuned for more food discoveries and exercise adventures in the City from yours truly. Hey FPOPers, make landscape, not landfill! 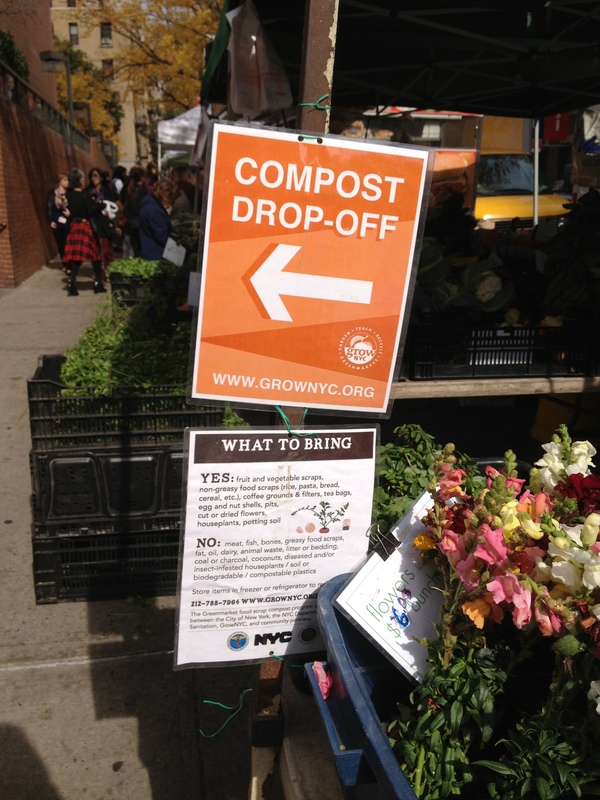 Greenmarkets around New York allow fruit and vegetable scraps to be transformed into compost. Food scraps comprise about 17% of NYC’s waste stream. Normally, this material is simply sent to a landfill; it contributes to NYC’s disposal costs and can create greenhouse gas emissions. However, when composted, food scraps and other organic waste become a useful product that improves soil quality for street trees, gardens, and more. Your household food scraps will be transported to one of several NYC compost sites to be transformed into a fertile soil for use on local urban farming and gardening projects. What can you bring to the compost collection sites? You can bring fruit and vegetable scraps, non-greasy food scraps (rice, pasta, bread, cereal etc. ), coffee grounds & filters, tea bags, egg and nut shells, pits, cut or dried flowers, houseplants, and potting soil. Food scraps can be collected in large yogurt containers or other covered plastic containers, plastic bags, milk cartons or in commercially-available compost pails. To reduce odors at home and at the Greenmarket, store items in the freezer or refrigerator. A layer of shredded newspaper at the bottom of your storage container also helps. 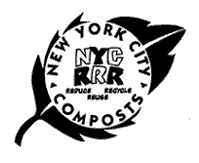 Visit www.nyc.gov/wasteless/compostproject to find more ideas on composting! 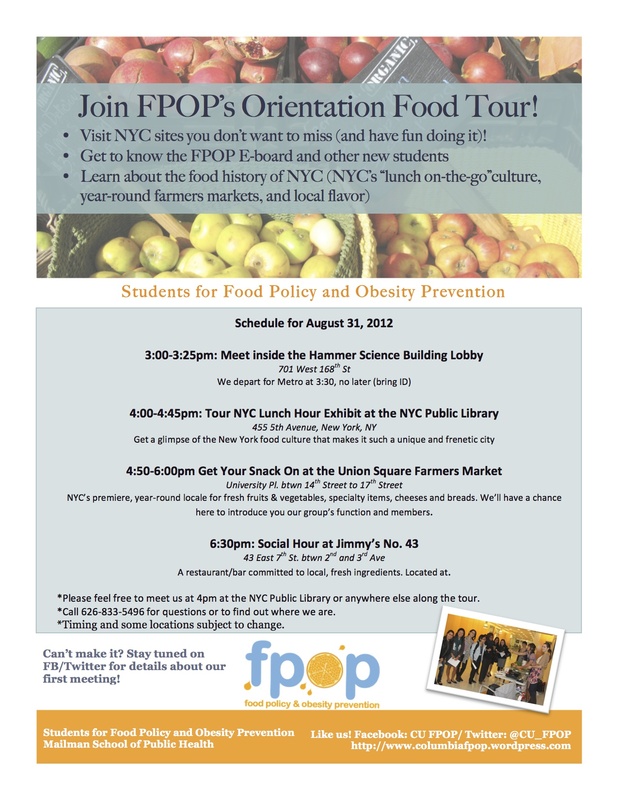 Join FPOP for an Orientation Food Excursion on August 31st! We hope you all had a wonderful summer! Join us for our Orientation event before the school year starts and get to know some incoming students while learning about NYC food culture and enjoying some local grub at one of our favorite spots! CORRECTION TO AGENDA: We well be walking to Jimmy’s No. 43 for the Social Hour (6:30-9:30pm) instead of Terroir on the Porch.